Keen golfers from the Meat Industry gathered at Surrey Downs Golf Club last week for BDCI's annual Golf Day. 17 teams in total set out for a Shot Gun start. Excellent support from companies insured there were many prizes, including 4 nearest the pins and 4 Longest drives. There was a beat the professional on the 2nd hole nearest the pin, along with a Golf Ball Raffle. The competition for the top places was very close with 9 players just a few shots apart. BDCI Festival Chairman Chris Aldersley officiated in the prize giving. 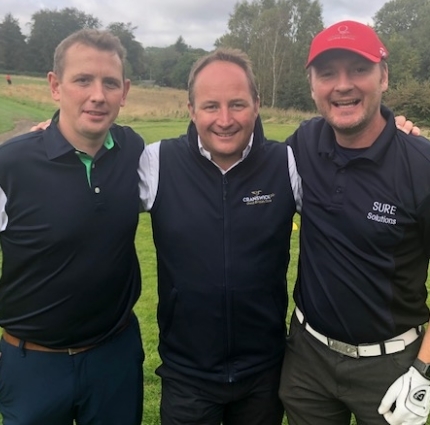 Chris Aldersely said, "It was a great turn out for this year's BDCI Golf Day, the sun was out and everyone had a very enjoyable day of golf. The golf day raises awareness of BDCI within the industry. Many thanks to Alan Bird from Two Counties Foods who was again instrumental in organising the day on behalf of BDCI and congratulations to Craig Costall from Sure Solutions who was the overall winner."